In business, companies large and small are always working on being strategic and developing growth plans. Individuals are less inclined to be strategic. That key difference is why employees, rather than employers, get caught off guard by business closings and changes in the business environment. But that can now change. With just five steps, four simple boxes, and one simple exercise, you can become as strategic about your future as any hot Fortune 500 corporation. The exercise is to fill in each of the boxes and then stand back to see appropriate steps to build on strengths, shore up weaknesses, prepare to take advantage of opportunities, and protect yourself from impending threats. There may be more items in one box than another, but there should always be more than one item per box. As basic as SWOTs are for businesses, they are rarely done for individuals. Now's the time to even the odds and put this simple business tool to work for you. Whether you're unemployed, employed but looking to grow into a new position, or under-employed and wondering how to break out to show your true potential, a SWOT analysis is a great way to take control of your own destiny. Here's how. Companies rarely do SWOT analyses onsite. They take their top executives offsite to gain some perspective and spend a day, usually with a facilitator, to fill in the boxes. Take yourself to a library, Starbucks or Dunkin' and spend at least 15 minutes on each box. If possible, take someone along who can act as your facilitator and spend at least a half day with you. Make sure to buy your "facilitator" some coffee, or a sweet, but their job is not to be sweet to you. Rather they need to press you hard and often to think of more items to put in each box, particularly the bottom two. Step 2. Be Your Mother. Humans, by nature, tend to concentrate on weaknesses. A SWOT analysis always starts with strengths. That's because given a choice, it's frequently more efficient for a company to further develop strengths rather than work on weaknesses. Here's an example. Google is great at Search.  No matter whatever other businesses they develop, their number one goal is always to improve their own Search functions so other companies can't enter that space. When you were a kid, it's a good bet that your mother would tell you how great you were and your answer was, "You have to say that because you're my mother." For this exercise, be your mother, and don't be timid in listing your strengths. It comes in especially handy when an interviewer asks the inevitable question, "Why should we consider you for this job?" 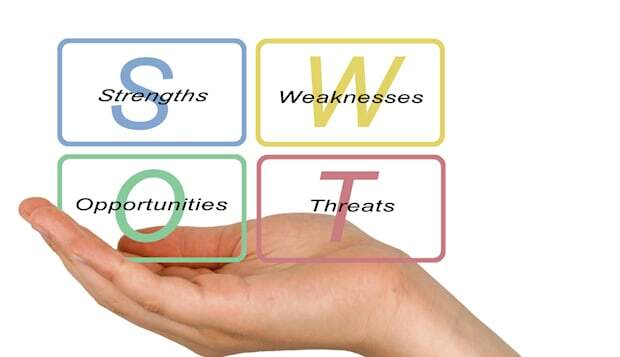 By doing the SWOT, your strengths will be on the tip of your tongue. Step 3: Be a Trend Spotter. To find opportunities, you don't have to be a psychic, but you do need to pay attention to local news. Is health care growing in your neighborhood? That means jobs in the health industry are growing and not just for doctors. Check local health care web sites for job postings on everything from accounting, customer service, food service, or shipping jobs. Have local politicians voted for solar energy? If so, someone local has a new opportunity for installing solar panels, and someone else can get good at selling solar in the area. Some of the best sources of new business growth are right at your fingertips. Check out employment trends at AOLJobs.com, or for a local perspective get a copy of state or city affiliated business news papers. The New Jersey Business Magazine, published by he NJ Business and Industry Association, appears to be just $24 for an annual subscription. In Philadelphia, a good source is the Philadelphia Business Journal. It has a heftier annual fee of $105 for both digital and print resources. Don't assume it's out of your range. Rather than jewelry or a tie, ask for a subscription for your next birthday or the holidays. Not sure what news publications are in your area? Check out www.bizjournals.com. Other easy ways to find opportunities is to follow business news sites. Start with Daily Finance and its affiliated business news site through the Huffington Post. Skim Fortune or Forbes at the library, two publications that specialize in recognizing business trends, or digitally flip through Wired or Fast Company, two publications that pride themselves on spotting business futures. Step 4: Become a Business News Junkie. A threat is something that is outside your direct sphere of influence but can affect your livelihood and growth potential. When it comes time to fill in the threats box, become a local news junkie – the kind who reads the local newspaper. As much as we like to fault newspapers for printing negative news, it's the negative news that clues you in to impending threats to your career. If you're in Atlantic City like me, the Press of Atlantic City has been printing news about casino troubles for years. The casinos have hated the negative press, but it gave readers insights into the industry's long-term viability. Your local news can give you some time to prepare for threats instead of waiting for the ball to drop.  Most people, when honest, are well aware of threats, but by not writing them down and facing them directly leave themselves unnecessarily open to business closures. It's the ostrich syndrome. If for instance, you are in the transportation industry, it's important to know why Uber is considered a disrupter, and how it may affect not only taxis but also rental car giants in big cities and soon smaller metros. And if you're interviewing for a transportation job, it's important to show prospective employers that you know where the industry is headed. Transportation News Tip: Check out this Fast Co. article on solar trends in public transportation. It's considered Jetsons-worthy. Step 5: Think Like a College Student. Companies are great at creating one-, three- and five-year plans. Once out of high school or college, people rarely think four years ahead, but it's that type of forward thinking that is required to keep you on a growth trend. It's easy to say that time is limited, there are only 24 hours in a day and you don't have time to follow the news, do a 5-year plan, or take an hour for a SWOT analysis. Time is a constraint we all face. But limited resources, including time, are easy excuses for not taking action now to protect your own future earnings. Then when a car dealership closes, people feel victimized. "It was out of my control," is a common lament. Instead take control back. Do a SWOT analysis on yourself and be brutally honest about your strengths, weaknesses, opportunities and threats for future success. Then get to work on pieces of the puzzle to strengthen your own positioning. It puts your career back in your own hands.